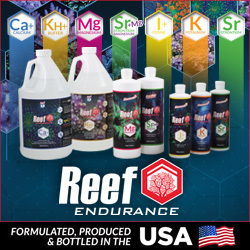 After decades of providing aquarium equipment to the masses, Reef Octopus is jumping into the part of the hobby that their various products have been servicing with the introduction of their own line of trimless aquariums. Being labeled as “Luxury Aquariums”, this line will feature two tanks, along with their matching stands and sumps, and an overflow system that is a little different than what we see from other large volume manufactured brands. The aquariums will come in a couple of different sizes, a 32 gallon and 48 gallon model, and will feature the same entry level options that have become a standard in our hobby: low iron glass and black silicone. 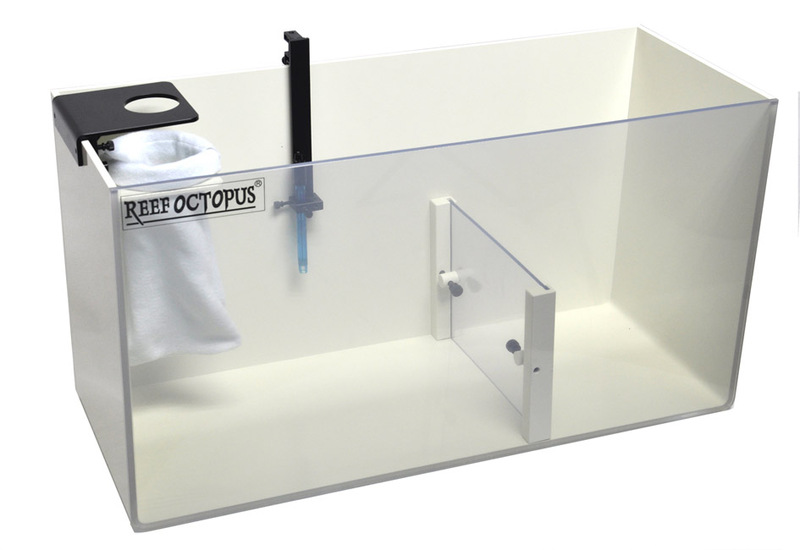 Despite the tanks having a lot of the same features of offered by many other brands, the Reef Octopus Luxury Aquariums didn’t fall in line with every feature. The first noticeable difference between the Luxury Aquariums and those built by the rest of the industry is in the overflow system. Instead of the big, bulky overflow boxes, the Reef Octopus aquariums feature a “black tube overflow”. 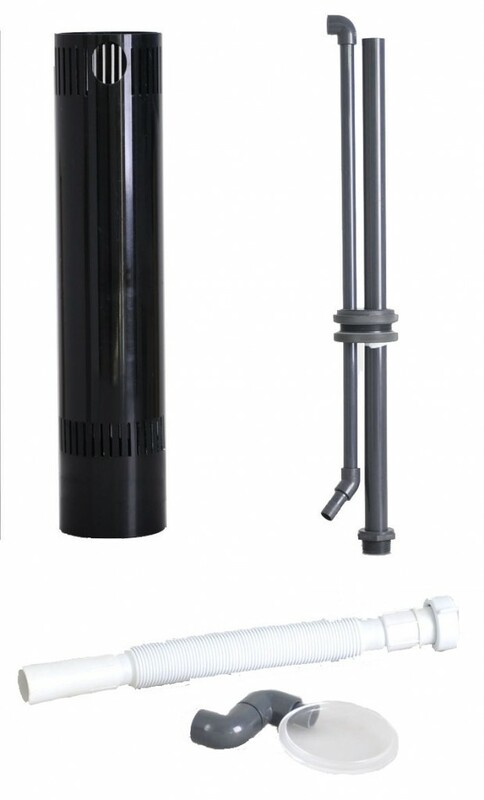 As the name suggests, the overflow box is actually a plastic tube with a tiny footprint, which also happens to draw in water at a couple of different water levels. This overflow was designed for simplicity, as it uses a single large bulkhead fitting that has a single hole for the return plumbing and another for the drain. In addition to the single bulkhead, the overflow is fitted with a small silencer to keep things as quiet as possible, and the bellows found in the flexible plumbing also makes things run a little more hushed. The other big difference in the Reef Octopus aquarium line is the fact that the hobbyist builds the stand. 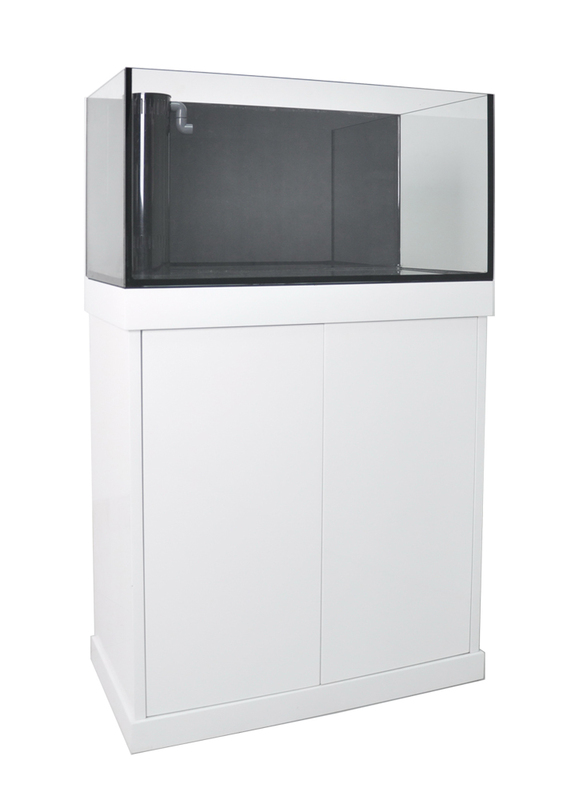 The stand is made of laminated MDF particle board, which again is almost a standard for non-customized aquariums, but it doesn’t show up at your door assembled. Instead, the aquarium keeper gets the wood, a sheet of instructions, and all of the hardware needed to get the tank functional. From a stability standpoint, this design means the stand may not be assembled as it should depending on the skill level of the hobbyist. Of course, most of aquarium keepers are DIY geniuses, but not all of us are unfortunately. This means there might be a few leftover pieces at the end of the build, and the stand may not be a sturdy, long term solution to holding your aquarium upright. The big bonus to this setup though is cost. With the stand being shipped as un-assembled wood pieces, there’s no big bulky package that costs an arm and a leg to get from point A to B. On top of that, you aren’t paying the company to assemble for you either, which further drives down the price (hopefully). And because no fully functional saltwater aquarium is complete without adequate filtration, last offering in the Luxury Aquarium setup is a sump. The sump isn’t made entirely from glass or acrylic, but is instead made from white plastic and a clear front pane. In terms of accessories, the sump comes with a filter sock assembly, an adjustable probe holder, and an interesting adjustable baffle that we haven’t quite wrapped our brains around yet. It looks as if the single plastic sheet just lifts up, but this would cause the entire water level in the sump to drop as water evaporates. A fluctuating water level within the sump is obviously no good for protein skimmer function, but we’re just making assumptions on how the adjustable baffle works at this point. Despite their being two different sized aquariums, only one sump is listed on CoralVue’s website. There’s no word yet on price or availability, but we expect the tanks, stands, and sumps to show up on pricing lists shortly.